For every user login created in the Logicbroker portal, that user will have access to a Logicbroker-hosted SFTP/FTP site for that company. Your Logicbroker username and password will be used to logon to both the stage and production SFTP/FTP sites created on your behalf. It is recommended that you do not use your portal credentials for an automated integration and create a new user for the SFTP/FTP user. This is to prevent you from the portal user from changing the password and breaking the integration. To learn more about creating users see this article. If you need to white list the Logicbroker IP address, it is 23.101.133.17 for both Stage and Production. When you login to your SFTP/FTP site you will see the following directories. This is where you can send/receive documents to your trading partner; each directory indicating the format to be sent/received. Please see the Document Specification here for sending correct formats. This directory will be used to send and receive all Logicbroker document types (except inventory). There will be sub-directories for direction (inbound/outbound) and each document type; see details below. For all JSON documents you are receiving in the /Inbound directories, they will appear based on status of the document. If the status is in Submitted (100) the document will be available for pickup. There will be a file per each document, there will never be multiple documents in one file. Once a file is removed the status will update to Acknowledged/Processing (200). There is a direct synchronization between the documents in the portal and their files. This is to provide a full audit of all SFTP/FTP activity and provide full visibility and verification when a document is removed from the directory. The Archive directory is an open directory allowing users to read and write without any files getting removed. Typically this is used only to archive data after picking up information. No Logicbroker processes, removing or adding files, will run for any of the Archive sub-directories. Jobs can be configured to auto-archive for each document type if needed; contact support for more details. InboundByPartner has the same functionality as /Inbound, however each of your partner's will have their own directory. <PartnerAccount> will be the Logicbroker account number for your partner. Inside each sub-directory for the document types will only contain documents from that partner. The Outbound directory will be used to send all documents to your partners. If you are a Supplier, you will be using the /Acknowledgement, /Shipment, /Invoice, /Return sub-directories to send your partners. If you are a Channel/Retailer you will be using the /Order sub-directory to send to your partners. This directory will be used to send and receive all Logicbroker document types. There will be sub-directories for direction (inbound/outbound) and each document type; see details below. For all XML documents you are receiving in the /Inbound directories, they will appear based on status of the document. If the status is in Submitted (100) the document will be available for pickup. There will be a file per each document. Logicbroker has the ability to add batching to your files, contact support for more information. This directory will be used to send and receive all custom XML maps that have been configured for each Logicbroker document type. If you have a custom XML format that you need Logicbroker to process, contact support. There will be sub-directories for direction (inbound/outbound) and each document type; see details below. For all XML documents you are receiving in the /Inbound directories, they will appear based on status of the document. If the status is in Submitted (100) the document will be available for pickup. There will be one file per each document. If you are batching your XML the status will change asynchronously. It will move from status Submitted (100) to Acknowledged/Processing (200) when the document is successfully added to the SFTP/FTP directory. Using CustomXML will allow you to support the use of an XML FuncAck. XML FuncAck will send as a receipt for your records when a file is received by the Logicbroker System successfully. For all CSV documents you are receiving in the /Inbound directories, they will appear based on status of the document. If the status is in Submitted (100) the document will be available for pickup. Multiple documents will be batched in one file. Each row will be a line item per order. This directory will be used to send and receive all custom FlatFile maps that have been configured for each Logicbroker document type. These are typically positional files or other formatted files. If you have a custom FlatFile format that you need Logicbroker to process, contact support. For all FlatFile documents you are receiving in the /Inbound directories, they will appear based on status of the document. Logicbroker will run a queued job for all documents in the Submitted (100) status and will post the files to the directories asynchronously, once successful moving the status to Acknowledged/Processing (200). The following directories will be used for all EDI document types getting sent or received through the Logicbroker system. There will be two directories - Inbound which will contain all EDI files being received from your partner and Outbound which is where all EDI files sending will be uploaded. All documents in the Logicbroker system will process off of a status based workflow. As a document is in the Submitted (100) status, the workflow will move the document to Acknowledged/Processing (200). Logicbroker can support mapping any EDI specification to our standard document types. Please contact support for more information. The Archive directory is an open directory allowing users to read and write without any files getting removed. Typically this is used only to archive data after picking up information. No Logicbroker processes, removing or adding files, will run in the Archive directory; there are no sub-directories. Jobs can be configured to auto-archive contact support for more info. The Inbound directory is where you will pick up all files that are sent from your partner. If you are a Supplier, this means you will be using the receiving orders (850) and FuncAcks (997s) here. If you are a Channel/Retailer, you will be receiving Acknowledgements (855), Shipments (856), Invoices (810) Returns (180), and Inventory (846). There is no sub-directory in this folder. The Outbound directory will be used to send all documents to your partners. If you are a Supplier, you will be sending Acknowledgements (855), Shipments (856), Invoices (810) Returns (180), and Inventory (846). If you are a Channel/Retailer you will be sending your orders (850). There is no sub-directory in this folder. All Inventory updates and setup can be accomplished using this directory. /Delta, /Matched, and / Unmatched are used to download item data from your partners and /Outbound + /OutboundMatching are used to send updates to your partners. Under the /ManagedInventory directory you will see all your partner's Logicbroker account numbers (<PartnerAccount>). Each partner you are connected with will have their own directory. 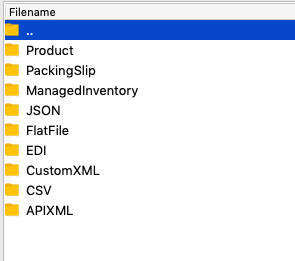 You can use this directory to send custom CSV/XLSX or XML. To add a custom map for CSV or XML contact support. Delta directory will provide an inventory file of all products that were last updated. This will only be used if you are receiving inventory updates from your suppliers. Matched will provide a full list of all products that are setup for your selected supplier; this includes products updated with inventory and containing no new updates. Outbound will be used to send your inventory update to your channels/retailers; this will be used by suppliers. OutboundMatching will be used to setup products. This is adding the SupplierSKU to MerchantSKU link. Once a product is setup with that linking they can be updated using the standard inventory import show in /Outbound. Unmatched includes a list of all products that were received in an inventory update that did not have a matching SKU. All inventory updates must contain a SupplierSKU to match our system to properly update quantities and other data. This is a list of all products that are not setup, but received the update from your partner anyway. If you need a way to receive packing slips, we can configure posting packing slips for orders received or shipments sent. All files will be in PDF type only. You will need to contact us to setup the configuration. The Inbound directory is where you will pick up all packing slip files that have been automatically sent to your SFTP/FTP. All packing slip files will be in PDF format. /Order will provide 1 packing slip per order, while /Shipment will provide one packing slip per Box.The packing slip will generate off the order as soon as it is received. If generating off the shipment, it will run when a shipment is submitted. Used by the retailer to pick up all product content that was sent by their suppliers. Used by suppliers to send product content in a format specified by the retailer.